The Ford Scheduled Service Plan is 100% transferable. So if you ever decide to sell your vehicle, the new owner can take advantage of the same great coverage. This added benefit may help attract potential buyers, plus it could bring an increased resale value for your vehicle. Transfer fee and restrictions apply. Your vehicle owner's manual or warranty booklet specifies the complete list of checks, repairs and replacements that need to be completed as normal scheduled servicing for your vehicle at regular intervals. Ford Scheduled Service Plan covers the same in full. Following are some, but not limited to*, the typical checks, repairs and replacements that will be performed on your vehicle. The actual checks, replacements and repairs on your vehicle depend on the type of plan you chose. The SSP is only valid within the period and terms specified by the given interval (i.e. 6 months or 10,000 kilometers whichever comes first). The clause "whichever comes first" must be strictly followed when availing the services covered by the SSP. This will help ensure that your vehicle gets the right servicing at the right time to maximize its performance. 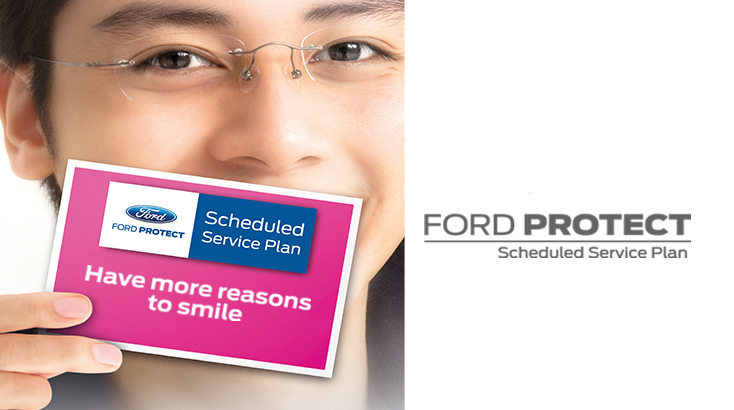 Visit your Ford dealership and ask about the Ford Scheduled Service Plan today. The information contained on the following pages is of a general nature and does not replace the policy terms and conditions of each product. You should refer to each policy booklet at your participating Ford Dealer for specific details, terms and conditions and exclusions.